The U.S. Dept. of Justice estimates that 85% of children in the juvenile system have below-average reading and comprehension skills. In light of these statistics, Fleming recognized that early intervention and support could prevent at-risk children from falling into the void of the juvenile system. As such, he sought a way for local legal professionals to assist children struggling to keep up with their grade’s reading level. The result was Lawyers for Literacy, a non-profit organization that enlists volunteers to work with third-grade children to prepare them for the reading portion of the FCAT by increasing their reading proficiency, speed, and comprehension. Since its inception in 2003, the Lawyers for Literacy reading program has expanded to three area schools and has been very well-received by students and their teachers. Lawyers for Literacy is a wonderful program that provides the opportunity for our third grade students to meet with lawyers on a weekly basis. The lawyers come to our school as ambassadors for reading, and the students become engaged while the lawyers encourage students to enjoy reading as a fun thing to do. We look forward to continuing this program next year. The Dynamic Indicators of Basic Early Literacy Skills (DIBELS) are a set of standardized, individually administered measures of early literacy development. The Common Assessment is a separate test prepared by the school. These tests are used to determine which children may need additional help in order to pass the FCAT. 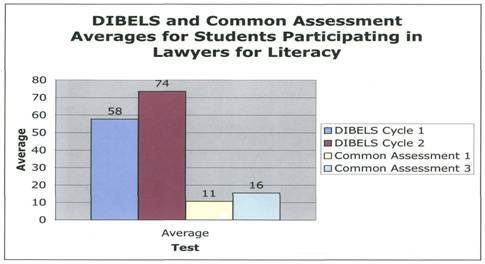 The first and third columns indicates the average scores on DIBELS and the Common Assessment before the Lawyers for Literacy program. The second and fourth columns show the average scores of the Lawyers for Literacy children toward the conclusion of the program, indicating a significant improvement in their reading abilities. 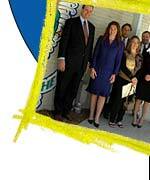 In fact, every child in the Lawyers for Literacy program last year passed the FCAT. More than twenty lawyers and judges participated in this year’s program, which concluded on February 21, 2007, just in time for the start of the FCAT on February 26, 2007. The volunteers worked one-on-one with students for an hour each Wednesday over the course of twelve weeks. For some, including local attorney Jackson Bowman, the experience has had a profound impact. Bowman was so inspired by the program that he would like to contribute to his child’s future education, and he is looking forward to returning as a volunteer for the next program, which will run from November 28, 2007 through March 5, 2008. In addition to volunteer participation in the reading program, Lawyers for Literacy encourages donations, which are used to purchase books for children in the program to encourage them to read at home and share their knowledge with their families and friends. For more information on volunteer and sponsorship opportunities for Lawyers for Literacy.